Are you considering a single outlet exhaust, but aren't too keen on having only one rear exhaust outlet of your MPS6 occupied by a tail pipe? Worried that our single exhaust might be too loud for your taste? Well, after innumerable requests, cp-eT has finally developed a quiet, full 3-inch stainless steel dual outlet exhaust system for the MPS6! 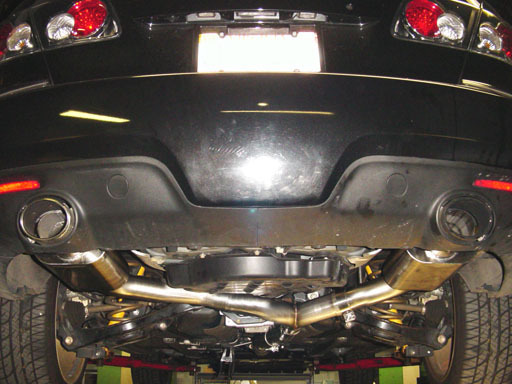 We had one pre-requisite going into the dual exhaust project that took precedence over all others, namely, that the exhaust system was quiet, yet still increased the breathing potential of the turbocharged MZR. To that end, we pulled out all of the stops and integrated two of our immensely popular 12-inch oval mufflers into the 3-inch stainless steel system. The resulting sound is incredibly warm, it has a gentle burble to it at idle, and is totally devoid of any drone at cruising speeds. Of course when you push on the go-pedal, it has a decidedly deeper tone despite that the overall sound volume hasn't increased substantially. We also worked very hard to eek out as much power from this kit as possible by removing every unnecessary restriction in the factory exhaust. Firstly, we used only straight through mufflers (unlike the stock chambered mufflers), so the resulting power penalty is negligible. 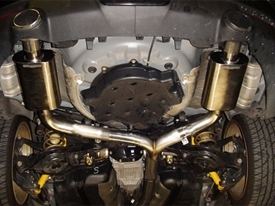 We also massaged the transition from the single to dual pipes. 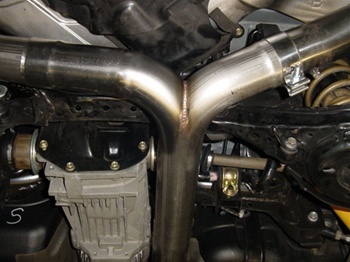 Anytime you make exhaust gas change direction, like you do in a bend, you create unwanted backpressure. So we put forth a great effort to reduce the abrupt transition at the single to dual split on the factory exhaust. Instead of a 'T' like the factory system has, our cat back creates a very gentle, proper 'Y' transition, which will substantially increase exhaust flow over stock. Catback kit includes 3-inch tubing, dual 12-inch oval mufflers, stainless steel band clamps, and a gasket for the downpipe.